Fabulous sauna benches that are made to measure. Find the price and place your order for your new sauna interior. 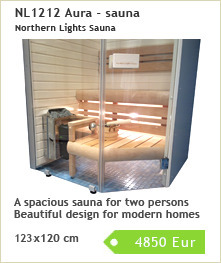 Fabulous high quality authentic Finnish saunas, a huge selection of sizes and options. 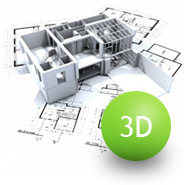 Try with our free room designer augmented reality tool. Northern Lights RAY are high quality infrared saunas, with several models and customizing options. New and unique saunas! Deco sauna is placed on a deck or patio. 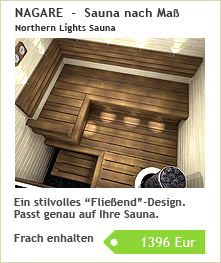 It's a high quality, high value, great sauna. Contura wood stoves and flues, and chimney for Kastor sauna heaters. 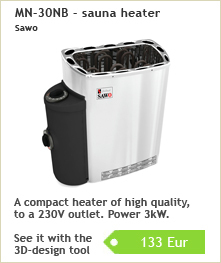 Sauna electric heaters from small 230V to large floor standing heaters, and wood heaters from Kastor. 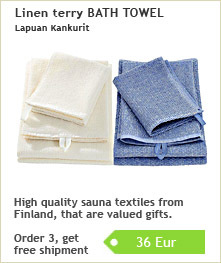 Lapuan Kankurit linen textiles Sawo fabulous sauna accessories. Hukka soapstone items. 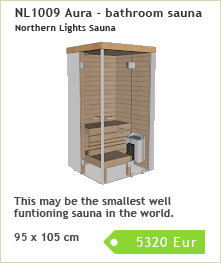 Saunastore is the authority in small saunas for bathrooms and small spaces. 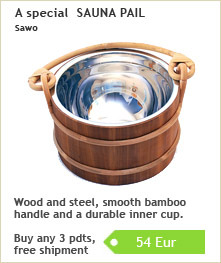 We offer great sauna accessories, that are valued presents such as Lapuan Kankurit linen textiles and Sawo sauna accessories.